The inhaler delivers a puff of nicotine vapour into your mouth and throat. It can be used to help stave off cravings, and many people find it satisfies the need to have something in your mouth to take the place of a cigarette. When you puff on the inhaler, it releases nicotine into your mouth. The nicotine is absorbed into the bloodstream through the vessels in your mouth. Nicotine withdrawal should get better within 15 minutes. Each 10 mg cartridge has 4 mg of nicotine in it. Use the inhaler for 20 minutes at a time (active puffing). The nicotine inhaler can be purchased at a pharmacy without a prescription. One inhaler puff does not equal one cigarette puff – 10 puffs of the inhaler equals 1 puff of a cigarette. ​Don’t eat or drink 15 minutes before using the inhaler. This includes chewing gum and candy. Coffee, tea, soft drinks, alcohol or citrus juices may affect how the nicotine enters your body. If you did eat or drink less than 15 minutes ago, rinse your mouth with water before using the inhaler. Side effects may include a sore mouth, coughing, hiccups, dry mouth, and stomach ache. 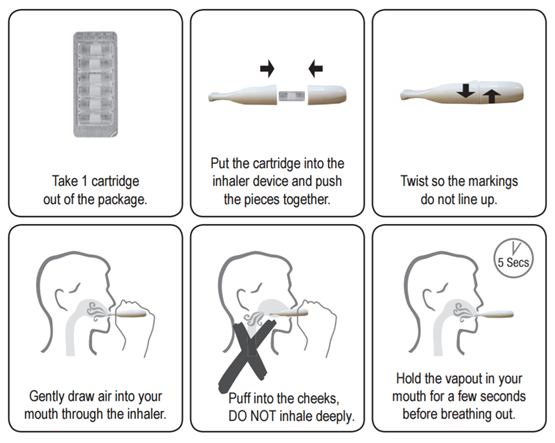 This may be technique-related, be sure to read over the instructions on how to use the inhaler.